With the right tools, it’s easy to organize and analyze all of your customer data. And the right analytics tool is Adobe Analytics. With Adobe Analytics, you can surface actionable insights from your customer data with a user-friendly interface, analyze customer analytics in real time to drive digital marketing, and seamlessly integrate with other Adobe Experience Cloud solutions. 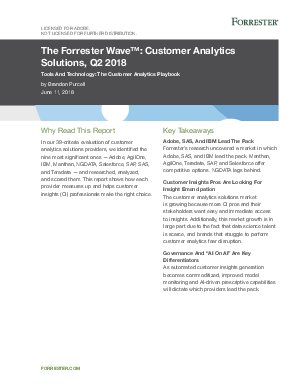 Fill out the form to download The Forrester Wave™: Customer Analytics Solutions, Q2 2018.